Join us in Dunquin for a relaxing and informative photography break, great for bringing along your knowledge of photography at any level of interest and ability. 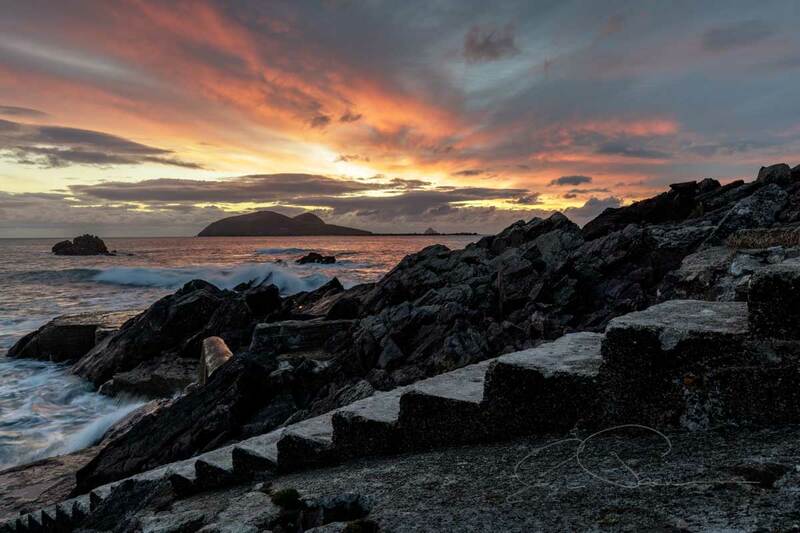 Based at An Portan Guest House for 3 nights and led by George Jackson, improve your photography at beautiful and stunning locations to the west of Dingle, during walks, tours, demonstrations and ongoing workshops that run from Thursday afternoon to Sunday afternoon. Experience sunrise and sunset expeditions to different locations every day. Learn photo editing with lightroom, photoshop and also try some of their paid and free alternatives. 7.00 p.m. Finish the first day with a visit to Dunquin Pier and hopefully capture some colour in the sky above The Blasket Islands. Out at 6.00 a.m. for a local sunrise shoot and taking advantage of the early morning light. 8.30 – 9.30 a.m. Back to An Portan for breakfast. 9.30 -12.00 Today is all about learning more about your camera and using settings and techniques that suit your own ability and knowledge. Whether you take JPEG or RAW or just use your phone, we’ll begin to cover all the things both as a group and individually that you want to know to obtain better results. 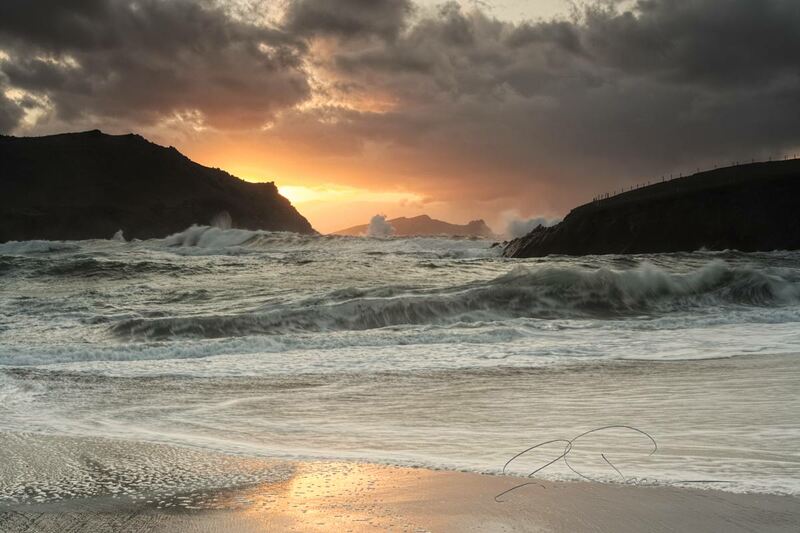 We’ll visit several locations around Dunquin with the option of some short coastal walks between them. We’ll also get an opportunity to look over some promising locations for our evening shoot. 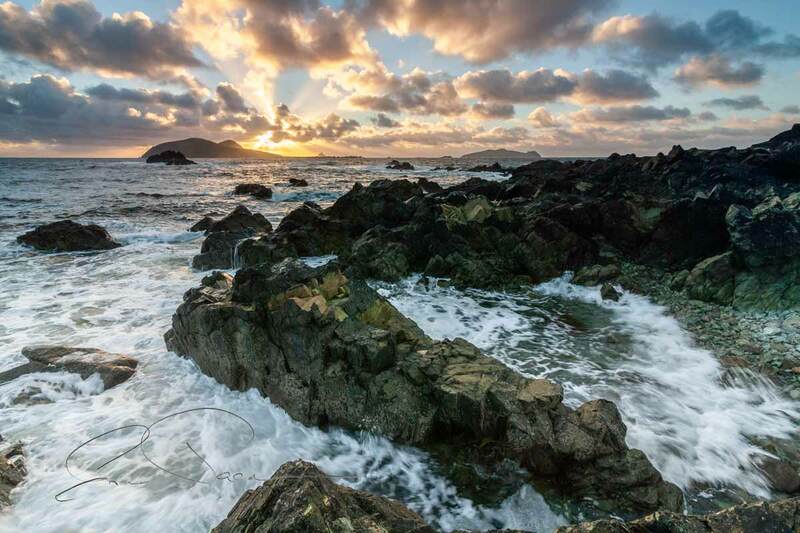 2.30 – 5.30 p.m. We’ll visit Clogher Head and then explore the wild and rocky coastline that leads away from Clogher Strand. We’ll continue exploring our camera settings and move onto filters, creative apps for our phones and using a tripod with detailed demonstrations of everything before you try them out yourself. 7.00 p.m. We’ll revisit the coastline in Dunquin for our evening shoot, we’ll continue to familiarise ourselves with graduate filters, creative phone apps, tripods and low light photography until dusk. While the coastal walks require a moderate level of fitness and the ability to climb stiles and traverse gentle slopes, for the most part, all the locations we visit on the walks can be easily accessed by a drive and/or a short walk. During the sunrise, sunset and photography tours on the Dingle Peninsula, all the locations we visit are easily accessible with a short walk using paths, tracks or reasonably level ground from where we park. In the event of unfavourable weather conditions, activities may relocate indoors taking full advantage of An Portan’s spacious conference and sitting room. Out at 6.00 a.m. for a local dawn and sunrise shoot, taking advantage of the wonderful early morning light. 9.30 a.m. -12.00 p.m. With the low of a spring tide uncovering the entire beach at Coumeenoole Strand, we’ll practice some long exposures with neutral density filters and apps on our phones as we explore along the waterline. From the car park at Coumeenoole a 15 minute hike takes you up and over Dunmore Head to the very western tip of Ireland with panoramic views of the Blasket Islands or if you prefer staying off the slopes we’ll drive to the cross at Slea Head with an option of a scenic walk back towards Coumeenoole along the winding road with vistas over Coumeenoole, Dunmore Head and The Blasket Islands. 2.30 – 5.30 p.m. Back at An Portan, and we’ll take a look at processing our images using different applications including Lightroom, Photoshop and Rawtherapee. 7.00 p.m. Evening around Slea Head and Coumeenoole until dusk, revisiting some of the locations from earlier in the day. !0.30 a.m. – 1.00 p.m. We’ll continue processing and hopefully end up with some fabulous images from the weekend. Includes single room, breakfast and dinner for 3 nights, photography activities and walks.